Pang Ming alias Pang Heming, was born in September 1940. He was the Chairman of Huaxia Zhineng Qigong Training Centre, Committee Member of the China Qigong Science Research Centre, Chairman of the Board of Advisor, Beijing Qigong Research Society. Dr Pang was influenced by the practice of traditional Chinese medicine (particularly acupuncture), qigong and martial arts since very young. He graduated fromBeijingMedicalCollegein 1958 and practised Western medicine after that. From 1958 to 1962 Dr Pang studied Chinese medicine at the Beijing Chinese Medicine Association. Subsequently he practised Chinese medicine. While studying Chinese medicine he started his research into qigong. At the beginning, he studied Buddhism and practised Buddhist-qigong. From 1964 onwards he increased his training in martial arts. From 1970 onwards he followed the teachings of various grand masters of Daoist and civilian qigong and researched into the various Daoist texts on qigong. His knowledge in both Chinese and Western medicine provided a very strong foundation for his research work. On the other hand his knowledge in qigong also greatly improved his medical practice. In 1979 Dr Pang founded the first qigong organisation for the mass public – Beijing Qigong Research Society. Dr Pang started to research into traditional qigong since early 1970’s and created Zhineng Qigong in 1982. He had since been to many parts ofChinato give lectures on qigong. He was widely accepted and highly respected by qigong practitioners. In 1987 he became the Deputy Director of the Eastern-Sports Faculty,NandingDayUniversityand gave lecture on Zhineng Qigong. 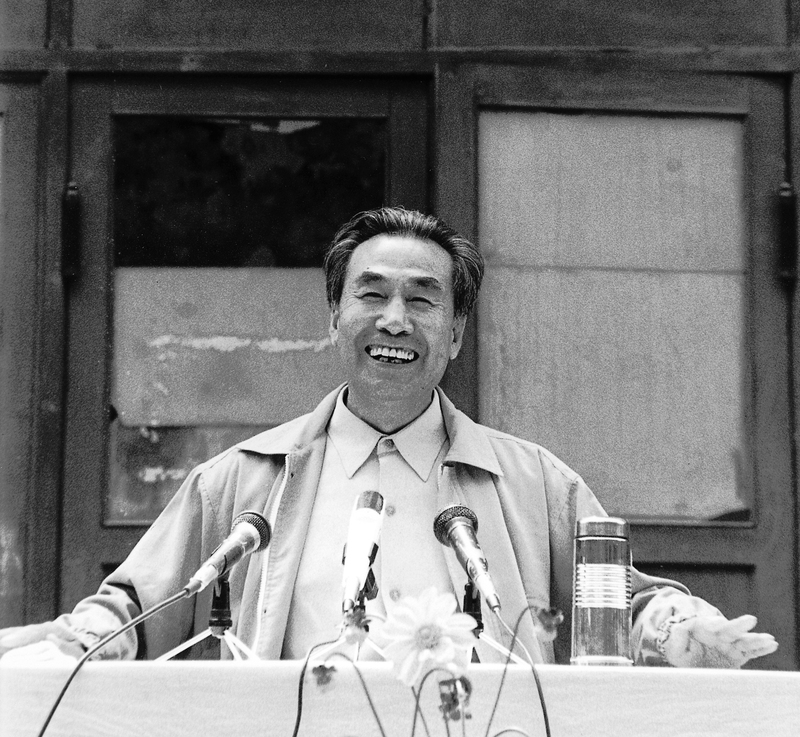 Dr Pang set upHebeiShijiazhuangZhinengQigongCollegein 1989. In November 1991 he moved the centre toQinhuangdaoand changed its name to Huaxia Zhineng Qigong Training Centre. Between 1992 and 1995 he set up Hebei Huaxia Zhineng Qigong Research Centre and Hebei Huaxia Zhineng Qigong Recovery Centre (which was probably the largest medicineless hospital in the world in history). Over the years the centre has treated more than 300,000 patients with 180 different illnesses, and achieved an overall effective rate of 95 percent. The use of qi had also been scientifically proven and documented to be effective in treating patients, to improve the yield of various agricultural and poultry products, to improve the quality of industrial production at virtually no additional cost at all. More than 3,000 theses on the research had been published inChina. On May 1997 Zhineng Qigong is awarded the certificate of approval from the National Sports Department’s Qigong Exercise Evaluation Committee. Zhineng Qigong was the first to get the approval amongst the first batch of qigong evaluated by the authority. Dr Pang, who is fondly addressed by his students as Pang Laoshi (Teacher Pang) has written many books on qigong. He has not only created Zhineng Qigong which is easy to learn and highly effective but has also written the Hunyuan Holistic Theory and created the use of qi field to teach qigong, to heal patients and to conduct research in an efficient manner. I read on Shaolin.org (Wong Kiew Kit’s site) that Teacher Pang He Ming founded Soaring Crane Qigong but then Zhao Jiangxin took it from him and called it his own. I learned Soaring Crane from Chen Huixian and am researching the history of it. Do you have anything you can share about this? Although this is an open secret but it is also a sensitive issue… do you read Chinese? if you do I can refer you to some articles. Yes, the story is true. Dr Pang was working on Soaring Crane and intendiing it to be a Medical Qigong that could be taught to mIllions. But he decided to refine it and simplify it and he went on to develop Lift Chi Up & Pour Chi Down instead. Some of his students that were helping with his research on the health benefits of Soaring Crane contiued with Soaring Crane feeling for themselves that it ws a complete system. I can read and translate a little Chinese, please do share what you can in any language. My direct e-mail is kevin@ancientway.com. where can I find his center/hospital for a friend who is ill? The centre was closed in year 2000. there are many healing Zhineng qigong healing centres now in China though. I have a friend that is very ill and dont have much time left to live. Can you please Tell me the names of the healing centers in China. Go to places where the locals go. This is truly inspiring. It is a shame politics must get in the way of good works. I truly wish I could visit a center in China, but I have not money for travel. cool guy dr.ming peng.he helped me feel the chi for the first time with a video on youtube.qi is electromagnetic. it is a life experience.you have to try it. now i got deeper in the qigong practice. great stuff,allso selective-lazy people give up fast. yes, you are right. I used Zhineng Qi gong now more than 6 months, to get rid of my EHS, electrohypersensitivity, and I am getting better and better, feeling so good in my body. and me too, I experienced this “Chi experience” you are talking about. really strange… and “wow!!! never knew, what is chi, before I felt it”. where is Dr.pang ming today (2014), and is he still teaching and healing people? can we reach him? Dr Pang is in retirement. We do not know how to reach him. Do you know of an institute in Beijing Practicing his work? It is very difficult, if not impossible, to contact Dr. Pang Ming. One sure way to learn unadulterated ZhiNeng QiGong is to be found, surprisingly, in Mexico City. Visit this site: http://www.fuerzaintegral.com and enter the english version of the site. This is the biggest ZhiNeng QiGong endeavor outside of China, founded by a man who got his formal training by Pang Mings masters on all three available levels of ZNQG practice. He was trained to teach and has done so since he was healed in the year 2000. He has since trained over 10500 students world wide. I would highly recommend this to anyone seriously interested or ill. Don’t have to go all the way to China, but it’s still abroad. With all respect there are few persons in the USA, and in Mexico who are teaching ZhiNeng. Just log into ZHINENG QIQONG & you’ll find them. I just took it with The Best of Me. USA. In California. Several cities in Mexico have it also. Even in Cancun. Just log into VidaZhineng QiQong. I thank you for your comment and completely agree with you. I have no idea if the claim of “one of the few persons allowed to teach up to the third level of ZhiNeng QiGong” could be true or not, but it might not be fair to other teachers. Mexicos teacher , Ling Yang Laoshi, is nevertheless a very talented teacher. He sticks strictly to Pang Laoshis teachings and advises his pulpils to do the same. That is what I meant by “unadulterated”. In his mind, Dr. Pang is a genius and a prodigy and he finds it ill advised to tamper with his work, lest one know more than Pang Ming himself. It might be a somewhat rigid or idealistic framework but it could also allow for a more “pure” qi field and very good practice. I have known of those whose instruction included several modifications to Pangs methods, which only resulted in the detriment of its reach and healing power. This saddens me. But overall I have nothing but the highest of respects for all teachers of this noble and beautiful science. it is possible to obtain an online course, I live in Brazil? Yes.. but we always conduct our classes around 2.30pm Malaysia time and it is 2.30am in Brazil..
Are there any contact details for Zhineng Qigong online course available? We always announce it here and also through our yahoo forum. Hello, excuse me if I disturb you… since the chinese center is closed, do you know any center in USA to recommend me, please? My half-brother is ill and he wants to go to a good therapist, please. Can you please write to David Peng? He is teaching in Hawaii. Master Mingtong Gu has many retreats and workshops in the USA. Master Gu founded The Chi Center which is now located in northern California. You can see his website at http://www.chicenter.com. Master Gu was trained directly by Dr. Pang at the Centre in China. Does Dr Pang still run any clinics? if he does, where are they held, also would you have a contact for him. Dr Pang has retired. Sorry, I don’t have his contact. Is there a centre in Malaysia where I can seek treatment for my terminal illness? Yes, we run therapy classes at our centre. FYI – there is plenty of Zhineng Qigong training available in Beijing! I just practiced with our group today, as a matter of fact. Level I, II, and III all available, however, from what I have been told, Dr. Pang is, indeed, not in the public eye anymore. However, great instruction from his first generation students is readily available. Come visit us! Hun Yuan Ling Tong!!!! Aloha my name is Lew Whitney. Along with my wife KarinCooke RN, we started the Kokolulu Farm and Retreats Center on the Island of Hawaii – we are wellness center based on Zhineng QiGong. We have been to China many times over the last 20 years and studied with many teachers/healers who studied and worked under Dr. Pang Ming at the medicine-less hospital in china. For the last 3 years we have been bringing these teachers/masters to our center. Peng Zou Ping (aka David Peng) was here for 5 months in 2014. We now have Zou Ping here until the middle of July. Along with Liu Jianshe, Zou Ping and three others from Dr. Pang Ming’s hospital they started the Hexianju QiGong Centre on Hainan Island China in 2003. We have been close friends since 2006.
hi i am really happy to hear this. But which place are u practising in.Beijing? how can i contact with u? I am also in China, Wuhan. Hello kind people of the internets, please advise if there are any zhineng qigong centres in Shanghai? I read Chinese, so any information would be appreciated in either language. Have been diagnosed with ‘terrible’ things by the western doctors, want to have a second opinion. Thank you very much for a quick reply! If you have difficulty reaching Master Peng please let us know. I communicate with him on a regular basis, as he was here as a part of our team at Kokolulu Farm and Cancer Retreats in Hawaii for 5 months. If we can be of any further assistance please do not hesitate in contacting us. Mahalo (Thank You)! I know David Peng quite well. There should not be any problem. Thanks anyway. Hello! My friend has uterine cancer . She lives in Russia. Please be advised to turn to for treatment. Thank you very much! Is she physically weak? Can she travel? Have to know her current condition to recommend something. Yes, it is possible that she went for treatment. Thanks for the quick response! Lew, thank you so much! I gave my friend your message . Dear Kean Hin, thank you for your message. I gave it to my friend. Hi! Is there a center that does Zhineng Qigong in Europe? Or if you know of any Dr.Pang’s students that practice this kind of healing in this area? My sister is very sick and traveling is very hard for her though still a possibility if there is no other options. They are both professional qigong therapists who perform both external qi healing and run self-healing classes. Is there a center that uses Zhineng Qigong in Europe? Or maybe one of Dr.Pang’s students that practices this kind of healing somewhere in this area? My sister has cancer and it’s very hard, almost impossible for her to travel far, though of course, it is still an option if there are no other possibilities, but still, I hope you know of a good practicioner in Europe.. It would mean the world to us. Also, thank you for all the information you provided on the web site, it is very helpful. Thanks! Where are you residing? I know a few therapists in Netherlands and Germany. Thank you so much for replying so quickly! We are in Croatia, but anywhere in Europe is just fine, it’s all a short flight away. So, who do you recommend? We have been following your posting about your sister who was diagnosed with cancer. We founded and operate Kokolulu Farm and Cancer Retreats in Hawaii http://www.kokolulu.org. We have been using Zhineng QiGong successfully for over 10 years. We have a very dear friend Britta Stalling who has a center in both Germany and South Africa. We have know her for many years and highly recommend her. Her e-mail is info@bodyandmindfactory.com or you are welcome to e-mail me lew@kokolulu.com and I’m happy to connect you together with her. If we can be of help please do not hesitate in contacting us. Blessings to your sister, yourself and your family. Hello dear people, My brother has been diagnosed with Gall Bladder cancer and I am looking urgently for an alternative way to heal him. Is there a center in Europe? I am based in Switzerland. Thank you so much! Hello dear people, My brother has been diagnosed with Gall Bladder cancer and I am looking urgently for an alternative ways to heal him. Is there a center in Europe? I am based in Switzerland. Thank you so much! Dear Irena, We have a centre in Penang, Malaysia. We also provide distance consultation through video Skype. But I am not sure whether there is any centre in Europe that run recovery classes. You may write to Irma in Netherlands to inquire, she provides outpatient consultation. Thank you for the prompt response, Kean! I will certainly try with Irma. We wish you and your brother all the best. Please note the time difference when calling us. We are 6 hours earlier than the east coast and 3 hours earlier than the west coast of the mainland USA. Did any of you got answers from them and have some precious pieces of information to share? As you can imagine a person that i know since many years got a cancer and, of course, chemiotherapy did not work as expected… Now I told her to eat daily raw leaves of a plant that can help against cancer but i don’t know for how long she can resist and be strong with herself. I would really like to give her one last bigger hope to hold on, so any of your feedback is highly welcome. Thanks anyways! As you can imagine a person that i know since many years got a cancer and, of course, chemiotherapy did not work as expected… A while ago I told her to eat daily raw leaves of a plant that can help against cancer but i don’t know for how long she can resist and be strong with herself. Both Irma and Bruno are my good friends. There is no harm if they don’t reply (they will). thanks for your super prompt response (and sorry for my double unnecessary post)! I will surely contact them then and see what can be done. It is a pity that you have never been to the Zhineng Qigong centre which was closed in end 1999. (I was never there too, what a shame..) At the peak period the centre has more than 4,000 patients/ students in the various classes and few hundreds staff working inside. Of course, none of them could survive without food or drinks. The centre did charge a fee for all the classes (low, but everyone has to pay) and also pay for food and accommodation. When the centre was ordered to close, all the staff were compensated accordingly by Dr Pang (from the reserve in the bank), none of them left empty handed. It is funny that some are thinking extremely highly about qigong therapists, they thought that we (and our families) can survive without food and drinks… well sorry to disappoint, I guess very few are able to do that. For an art to go on, I believe minimally it must be able to allow the practitioners to make a decent living and there is nothing wrong for us to charge a fee for our professional services. Sorry for my spelling mistakes in the above comment, I meant “here” no hear. Thank you so much Kean Hin for your answer. and for giving me an opportunity to my comments, even if you donot agrre. I could be mistaken but what I said is from my own experience and from what I read from another spiritual or energy healers. The conciousness or spiritual devolopment according to Dr. Pang goes together with the healing, My question is Why are some practitiones avoiding to face their fears. The Creative Life giving energy would never stop giving food or energy to the ones that serve and give life. It is a matter of trust and leap of faith. Either you are or you are not giving yourself to it. Probably many people gave amazing donations as a gratefullness act, and probably this is what Dr. Pang distributed to all for being fair. I believe like Dr. Pang (I read an article with his words confirming this) that besides his Qigong method, the amazing results and power of that hospital for the healing was coming from the Field of Strong Energy created by the practice of Qigong by houndreds of patients and volunteers in one place and in one moment, united in that leap of faith to the Energy with no fear or interest. Everything needs a sacrifice, its not possible to serve 2 oposites at the same time, Money can be an opposite to the Spiritual Energy, as money has to be under its order. The healing success of that hospital based on its attraction could not have happened with commercial rates, and could not have attracted the necessary big number of humans united in healing for that success. 1. Indeed the medicineless hospital was a great success. However, the centre was a registered business entity and there were no volunteers, all the staff were paid and compensated accordingly by Dr Pang. 2. Qigong healing (teaching self healing or providing external qi healing is a form of service, as long as we are at peace with our self or at peace with our conscience, it will not disrupt the progress (of course one has to know what and where is self…) Simply put, it is whether you own the money or were you owned by the money. 3. Instead of discussing why some are charging thousands or millions we probably have to ask those who have paid for their opinion. We probably have to ask those who have to purchase highly priced branded products to know why can’t they use something that costs a penny. 4. No one is stopping anyone from becoming a healer that do not charge anything, Anyone can train and give the expensive a challenge. Isn’t that great? I live in South Africa and would very much like to learn Medical Qigong, Can you please advise me who is the best teacher as close by as possible? Our currency is worth very little to the Dollar or Euro. Hi, Sorry, although I do have a number of clients in SA, I am not familiar with the practice of qigong in SA..
Zhineng Qigong is a powerful form to get well, but it is not a medical qigong. Zhineng Qigong is a comprehensive form with the objective of allowing practitioners who wish to dwell deep enough to understand the Self. External qi therapy is part of the practice of Zhineng Qigong. What I was trying to say is healing is merely a part of Zhineng Qigong, not all. Hi there ! I am a graduate of western medicine in india. I would like to learn zhineng qinong . is there someone you could recommend for me to learn from – it could be anywhere in india ? Thanks ! Is there some way for me to even send an e-mail to Dr Pang ? I am not aware whether Dr Pang is having an email account.. There are many ways to learn and many ways to teach. Let it be. How about any healing center in Dubai for Qigong ? Following the teachings of Dr.Pang Ming is there any guide in Dubai or UAE ? Can I have the contact of Qigong healing in Dubai or UAE who follows Dr.Pang Ming ? I would like to get in touch with doctor Pang since I have a 23 years old nice who has been in coma over the last 7 months. We have no Chikung healers in Guadalajara Mexico so I´ll really appreciate your advice, since we can nor take her abroad due to her condition. i need something like that can anyone help give any phone numbers or emails for me to make contact. Sorry, the centre was closed in year 2000. Dr Pang has retired since then. No idea whether there is anyone doing this now. Hello. I read so many healing stories from qigong masters that i would like to know if there is any hope for my 12 year old child that was left brain damaged ( tardive dyskinesia /dystonia )after the use of antiphsychotic medications given from doctors to supposidly treat adhd. I dont know if it works for brain problems but if there is any hope for cure i want to offer it to him. Hi, can you email me directly at okhpen@gmail.com? Can you please kindly tell me if there is any way I can purchase the Chinese version of Dr Pang’s books? any center or workshop in Thailand? or Hong kong? Thks. Are you interested in opening a center in GOA and healing and teaching people the knowledge of healing without medicines.. Thanks for the invitation but my team and I are too tight up with the current work on autism and we have planned to work on dementia/Alzheimer’s next year. Let me know more about what’s on your mind, perhaps I might recommend the plan to friends who might be interested. Hello! My father has lung cancer . He lives in Indonesia. Please advise me who to turn to for treatment. Thank you very much! I am suffering from epilepsy that investigating ways of drug-free treatment. If you know the centers or healers that can heal me, could you inform me? So i have been looking up Qigong Zhineng, and read up on the works of Dr Pang Ming, his medicine-less clinic and how he helped the ill. Since I am interested in getting treatment myself, I was shocked to learn that Dr Pang Ming’s students are charging exorbitant prices for treatment. The Dr himself seemed to care genuinely about healing people and he barely charged the patients anything. Why did his students not learn to NOT make exorbitant profits from a gift they were given by Dr Pang Ming?! I think that would be part of the teaching as well, to help people. I understand making a little money from it to sustain themselves and their practices but the treatment costs I have seen on their websites make it unobtainable for a lot of people, including me. I’m so disappointed! I don’t see a difference between the big pharmas and these Qigong Zhineng healers. At the end of the day it seems they care about filling their pockets. My friend, there are many others who are running courses at different rates, some asking for higher fee, some lower. I guess this is something beyond anybody’s control. Just select what you prefer and let it be. With all do respect we feel it is important to respond to your comment about people getting rich using Dr. Pang’s method’s of helping people to heal themselves. KoKoLuLu is a public charity non-profit organization founded by Karin Cooke who is a registered nurse with than 45 years experience and myself Lew Whitney who has more than 40 years in the health care counseling and healing arts field. We take no money personally (we live on social security and a our retirement) from the fees that Kokolulu charges to come to our centre. The services provided are generally on a one on one basis 24 hours a day/7 day’s a week in Hawaii. The monies collected go to support the non-profit organization which provides 85% of its students with services at little or no cost. Those who can afford Kokolulu’s published fees help to “pay it forward” in helping others. These fees along with generous donations from many people, have been able to operate successfully for over 14 years. We wish you and everyone all the best in your sacred healing journey. to be or not to be….. Myra brings up here the subjet that I brought long ago. The cosmic FREE life giving gift that we all can call to, can really come when we donot offer it free¿¿ I repeat in my opinion Dr. Pang´s most important lesson, was the way he created the medecineless hospitall: He charged the minimum maintenance fee, so houndreds would come so the healing creative energy would multiply in response to the not egocentric call of the hundreds. How can any organization or person charge those type of healling amount¿, when the knowledge and the healing power is given free, free has to be given back. A non profit in my opinion does not need to get the money from treatment payments, to help others, the money can come from the gratitude and donations given by the cured. The most important thing in my opinio n is to do like Dr. Pang and in a free way call to hundreds as more as possible so the magical energy multiplied by the numbers work. I heard that Dr Pang had four main prominent students, have you heard of this or know who these are? Many thanks. I have never heard about this. Anyway I divide teachers into few sectors, and I must say that I have yet to see one like Dr Pang, who can cover every aspect. 1. Healers: Those seniors who were trained by Dr Pang when he started ZQ in the 1980s. A pity, many of them have passed on or retired in recent years. 2. Trainers: Those who have the true experience of what is high level, able to demonstrate and allow you to experience what it is like instead of just explaining academically. 3. Academics: Those who are able to explain the theories well, but would normally not demonstrate anything. 4. EC executioners: Those who have high ability to perform EC, like performing experiments to validate that the mind can make changes to the physical world. They were trained to perform experiments like mentally breaking needles etc. My friend has been diagnosed with breast cancer(Left breast – 2 lump nodes) (4th Stage). It has spread to her lungs too. Her body is too weak to go for Radio or Chemo. Currently she is on oral medicines only. Can ‘Zhineng Qigong’ technique help her to cure it? Is there any of you center in India? Sorry, have no idea whether there is any centre in India. There are many centres in China, but classes are mainly conducted in Chinese. I’m trying to find informations about the huaxia zhineng qigong clinic and training center and why it was closed. Do you have any background informations about it? I read it was closed due to a new chinese law that forbids to practice qigong in groups of more than 50 people? And that in general no private qigong institutions are allowed in China? Does the chinese government want to keep the health-institutions in official hands of why would they close such a promising institution? Thank you for any information. Yes, the centre was closed in year 2000. I am not sure about the rule to forbid more than 50 people in a group practice but I am aware that there are still many people practising qigong in the parks without getting into any problem. Nothing is really too bad. Since his retirement, Dr Pang has published 4 books, I am quite sure he would not be able to do so if he is still running the centre. I am from Australia and I am planning a trip to China early next year to learn some Qigong. At present my only experience with Qigong is Shibashi (which I love). I am interested in Zhineng Qigong but Im unsure as to where it would be best to find a reputable teacher while overseas. I would like to learn the practice with some intensive tuition so as to return home with a strong enough foundation to continue it confidently. Do you have anybody to reccomend in China or Taiwan? Are there classes in Malaysia that are suitable for English speaking people. I’m wondering what would be the best option for me. I was hoping that if I was to practice for 1 month I might feel very confident to continue and maintain benefit when I return home. Many thanks for anything you are able to share with me. As far as I know Zhineng Qigong is not common in Taiwan. China government has relaxed the control on qigong in the last 2 years, however there are very few centres that are conducting classes in China. We provide distance consultation, please write to me at okhpen@gmail.com for more information. Please feel to contact us. We are Kokolulu Farm and Cancer Retreats in Hawaii. We use Zhineng Qigong (developed by Dr.Pang Ming) and Food as Medicine developed by Dr.James Gordon. We have been studying and teaching in China for over 25 years. We have just returned from taking a group to China. We have studied with several masters trained by Dr. Pang Ming and we were at the medicine less hospital in 1997. We have had many successful healing stories a lot with stage 4. Please feel to contact us if we can help you and your husband.